The Bharatiya Janata Party (BJP) seems to be pushing up political advertising using digital media once again, after a brief slowdown in the previous week. It dislodged the Indian National Congress (INC) from the top of the weekly advertising spends on Face­book. The BJP page accounted for the largest spends on the social media network for the latest week. It also topped the list of cumulative spends according to search engine Google. Both release periodic updates on advertising, which involve political content or issues of national importance. The move is a bid to introduce greater transparency on issues that might influence the public on such matters. 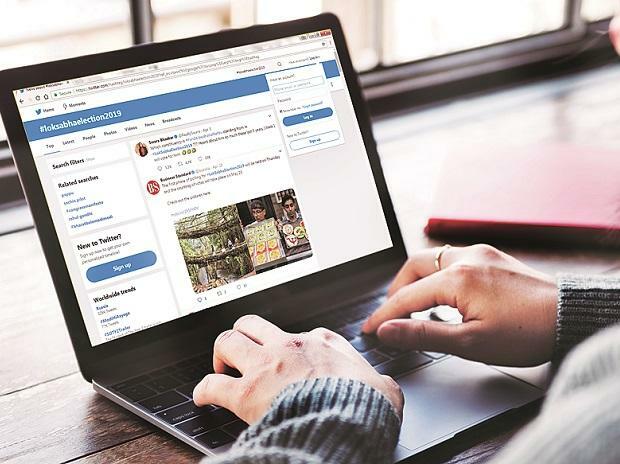 Social media and digital advertising came in for criticism after allegations of meddling in the United States of America’s presidential elections. It was also accused of being influential in shaping public opinion on the United Kingdom’s decision to leave the European Union (the so-called Brexit). The BJP's page accounted for around a fifth of all Facebook ad spends during the week ending April 13. It topped the list of top-spending pages. But all the other four spots in the top-five list were regional or non-BJP pages. They included the Indian National Congress, AP with CBN (promoting Andhra Pradesh Chief Minister Chandrababu Naidu), TDP and the Aiadmk Open Forum, for the AIADMK. The variety in the top five suggests that the online ad space is becoming more closely contested as elections are underway. However, overall advertising Facebook spends seem some tapering. The cumulative spends are up from Rs 12.4 crore for the week ending April 6, to Rs 14.8 crore for the week ending April 13. This is the cumulative spend for all political parties since February. This represents an 18.9 per cent increase over the previous week, similar to the growth for the last week as well. The three previous weeks had seen growth of over 20 per cent every week. The total advertisements have increased from 61,875 to 72,694. Others who have slipped from the top-five list for Facebook include video platform Eros Now. It was on the list last week because of promotions for a show on Narendra Modi, classified as political advertising. Another page, ‘Praja Theerpu - Bye Bye Babu’ worked for the YSR Congress from Andhra and Telangana. It too was in the top-five the previous week but doesn't find a mention this time. The Congress had topped the previous week with spends of Rs 19.98 lakh. The BJP’s page topped this time with Rs 51.1 lakh. 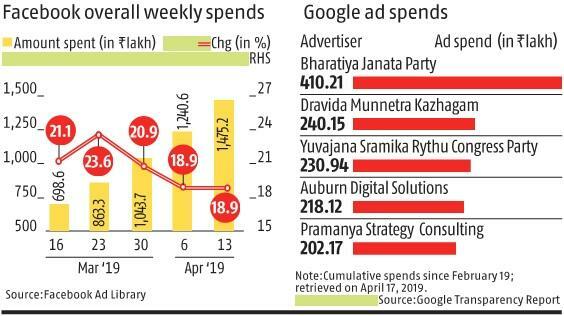 Search engine Google's latest political advertising spends report shows cumulative spends at Rs 13.9 crore since February 19. It lists the BJP as the biggest advertiser. It accounts for Rs 4.1 crore in spends, close to 30 per cent of the overall spends. The DMK comes second with Rs 2.4 crore. The Yuvajana Sramika Rythu Congress Party is third (Rs 2.3 crore). The total ads is 3,794. The biggest spenders include Andhra Pradesh, Tamil Nadu and Telangana.